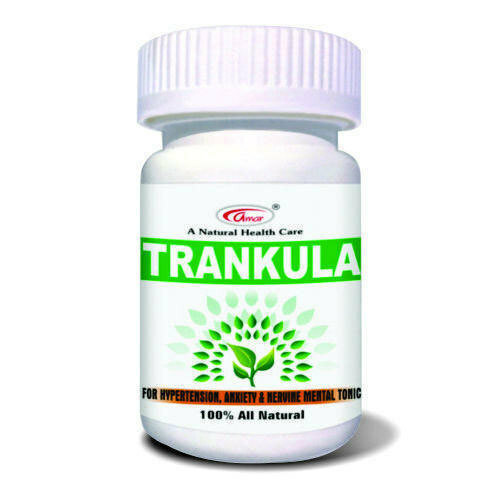 Trankula Capsule is a unique herbal remedy for hypertension containing ayurvedic time-tested herbs known to help patients with high blood pressure, anxiety and insomnia. When added to an individual's diet acts extremely fast and it is not uncommon to see results within 2-3 days. It provides fast effective treatment to relieve all symptoms of high blood pressure like sleeplessness, anxiety, restless legs syndrome, anxiety etc. A completely natural, safe fast acting and supremely effective hypertension remedy. Some of the herbs that make Trankula Capsule a powerful herbal remedy for high blood pressure. Brahmi has been traditionally used for nervous disorders, epilepsy, senility, premature aging, hair loss, obstinate skin conditions and venereal diseases. It is considered the primary Ayurvedic nerve and cardiac tonic. It pacifies high vata or pitta. Brahmi relieves mental fatigue, brings undisturbed sleep and treats convulsions. Scientific research suggests that Brahmi (Centella Asiatica) improves memory, mental functions and reduces learning time. Ashwagandha is highly valued for its restorative action on the functioning of nervous system and counteracting high blood pressure. It corrects loss of memory arising out of long term stress, illness and overwork. Restores vitality in those suffering from overwork and nervous exhaustion. In fact having the ability to nurture the nervous system, counteract anxiety and stress to promote a calm state of mind, the same ashwagandha having powerful anti-inflammatory properties, is specific for treating arthritic and rheumatic conditions. Popularly known to treat sleep disorders - stress and anxiety, shankhpushpi is quoted in charaka to be the single greatest herb for enhancing all three aspects of mind power - learning (Dhi), memory (Driti), and recall (Smriti). Thus it is called the greatest Medhya Rasayana (that which enhances the mind). It helps the quality of sleep by improving mind-body coordination. Shankhpushpi is also very beneficial for the nervous system, enhancing the quality of bone marrow and nerve tissue (Majja Dhatu).